On This Day in Def Leppard History - 6th July, the following concerts and events took place. 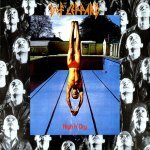 Including the UK release of the 'High 'n' Dry' album in 1981. The album reached number 26 in the UK Top 40 album chart. It spent 7 weeks in all on the chart. As of 2013, Def Leppard have played 9 times on this date.